A few days ago, I read an article by Caleb Durward about coping with stress and tilt in Magic. Although aimed primarily at players, I think its lessons are broadly applicable for judging, too. One of the many aspects of the article that I liked was Caleb’s suggestion to develop a routine that helps you calm down between rounds. He specifically mentioned that his ritual often includes playing a round of a “softer game” — basically, something that’s less complex and time-consuming than Magic. Although I’ve never met Caleb or talked with him about “softer games,” his point resonated with me, because I’ve come to the same realization. In fact, one of the softer games that Caleb mentioned is a personal favorite of mine as well: Love Letter. Especially in recent months, I’ve found games like Love Letter to be an invaluable part of my judging experience. So, I wanted to take some time to talk about these games, why I like them so much, and recommend a couple of my favorites for you to try. Let’s begin by talking about what Love Letter is. Love Letter explicitly bills itself as a light, fun game of cards. The premise of the game is to eliminate your opponents each round — using deduction, skill, and a bit of luck. But, of course, your opponents will try to do the same to you! Love Letter uses a small deck of cards, each of which has a special power. Everyone starts the round by drawing a single card. On your turn, you draw an additional card, then play one of the two cards you’re holding. Many cards involve comparisons between your card and an opponent’s, or otherwise interact with your opponent’s card in some way. One card eliminates an opponent if you guess their card correctly; another lets you peek at an opponent’s card; a third simply prevents you from being targeted by your opponents for a turn! Overall, there are only eight different cards, and even if you can’t remember what they all do, there’s a handy cheat sheet to remind you. The game is fast-paced, easy to learn, and relatively simple. As such, it makes an excellent diversion — whether that’s during a break, while waiting for dinner, or even when you’ve gotten snowed in after a judge conference. It’s also incredibly portable (unboxed, the game is small enough to fit in my jacket pocket). If you really wanted, you could even construct your own impromptu Love Letter deck using draft chaff (just find cards with converted mana costs 1 through 8). One of the reasons I like Love Letter that judging Magic really makes me want to play Magic. Although I bring a couple Constructed decks to most events, it’s often hard to find enough time to really get a game going, or another person who brought the same format, or enough space at the dinner table, or…and so on. 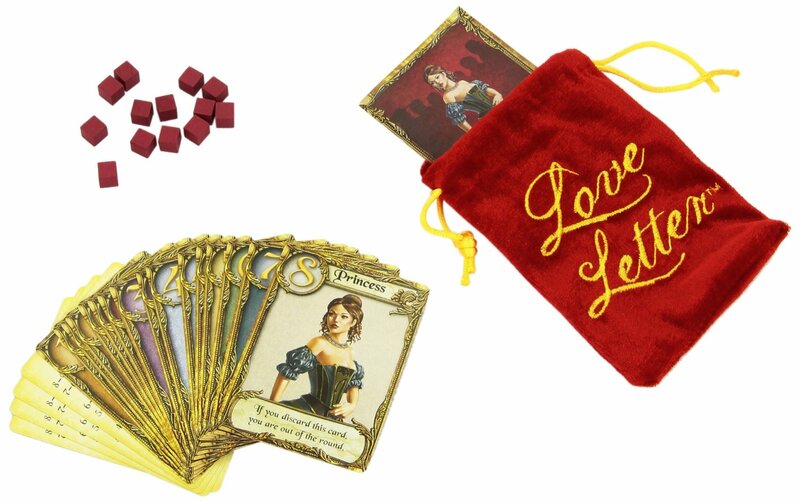 A game like Love Letter solves most of these problems: it’s quick, light-hearted, and simple to teach, but still complex enough to be fun and satisfying! Another advantage of short games like Love Letter is, well, they’re short! More specifically, it’s easy to pick them up but also set them back down. In contrast, once you’ve started a game of EDH, there’s massive pressure to stick it out until the end — but it’s not always clear when that will be. More than just being short, Love Letter solves this issue by breaking its gameplay into discrete rounds. The game’s end condition technically occurs when someone wins a certain number of rounds overall. But each individual round tends to feel fairly significant, so it’s usually not a big deal to abandon a game before that condition is reached (if your break ends, or dinner arrives, or whatever). Finally, Love Letter is a great icebreaker. It’s always great when I head out somewhere with a group of people and we immediately start chatting about things, and in those cases I’m quite unlikely to suggest playing a game instead of conversing. But if that atmosphere doesn’t materialize right away, I’ve found that a short game is a great way to get people involved and invested in something. For these reasons, Love Letter and games like it are now part of my own ritual for traveling to events. These days, I always bring at least one small, short game that I can easily bring with me on break or to dinner. Love Letter is a perennial favorite, but for a few months I zealously spread the gospel of Sushi Go as well. Most recently, I’ve found a lot of success with Red7. Sometimes I bring other games that are less portable and/or have longer time requirements, like Codenames or The Resistance; however, these are generally in addition to a small-box game, not as a replacement. As the above paragraph suggests, I put a lot of thought into what board games I bring to an event. This is because, much like every card in Magic fills a particular role in the metagame, so too do different board games suit particular situations, and tend to create different kinds of experiences. As judges, we spend a lot of our time thinking about how to create fun events for our players — but we should also make sure to make events fun for ourselves, too. Planning which board games I’m bringing to an event is one way I do this, but it’s far from the only way. For your next event, I challenge you to think about the strategies and rituals you’re employing to ensure that you (and your fellow judges) are going to have a good time. Is it bringing a special snack to keep up your energy? Visiting the vendor booth to sell or buy cards? Scheduling a time to call your spouse or other loved ones? I’d love to hear your thoughts and suggestions in the comments! Until next time, may you always love the game. I’m still struggling to find a routine/ritual to make especially the mornings of big events great for me personally. I know being well fed & caffeinated is super important for me, but it’s a struggle to get my physical shape dialed in for the player meeting–by round 3 or so, I’m normally set and in good shape for the rest of the day. For the full staff, I like high-fives. When team-leading, it’s a big priority of mine to make sure that I have my team’s back, and can let people sneak a few minutes off the floor after a particularly mentally/emotionally taxing call. I’m not sure I’ve been successful (especially in allowing myself these moments), but it’s an ideal. Even at larger judge gatherings, I like to avoid playing magic. While we all love the game, people come to MTG for their own reasons. It’s too easy for things to focus on the particularities of that game of magic, rather than getting to know the people around you. Having something that ‘matters less’ be the focus leaves more room for everything else, including relaxing & just having fun.